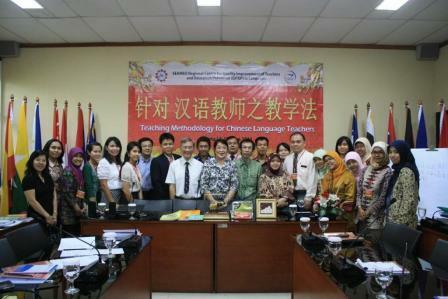 SEAMEO Regional Centre for QITEP in Language conducted a training on Teaching Methodology for Chinese Language Teachers from 5 to 18 June 2011. The training aimed to identify and analyse Chinese language teaching practices at schools, integrate Chinese language learning with cross cultural contents and conduct a teaching and learning process using communicative methods. The training was attended by 17 participants coming from Indonesia, Thailand, Lao PDR and Malaysia. The resource persons came from universities and institutions from Indonesia and abroad. The experts from Indonesia were from Jakarta State University, Bina Nusantara University, Indonesian Police Language School, Association of Educators and Mandarin Language Coordinators in Indonesia, Jakarta Training Centre and Centre for Development and Empowerment of Language Teachers and Education Personnel, Ministry of National Education Indonesia. The experts from overseas are from University of Hong Kong and a volunteer teacher from People’s Republic of China. During the training, the participants learned teaching five elements of Chinese language, teaching four language skills, apporaches in language teaching, Chinese language learning models, evaluation and assessment, design syllabus and lesson plan, cross cultural understanding, and using multimedia for teaching Chinese language. Apart from the classroom activities, the participants also had a chance to conduct both academic and cultural visits. For academic visit, they observed the teaching and learning process of Chinese language at secondary level, that is SMA 39, Cijantung, East Jakarta. As for cultural visit, the participants went to Batik Museum in Tanah Abang, and to Jakarta Fair in Kemayoran, Central Jakarta. In the museum, each participant succeeded to make a Batik handkerchief.